Nate Lopez, professional musician and extended range guitarist, has been playing his Novax 8-string electric hybrid guitar/bass for many years, but he was looking for an acoustic guitar to bring a new dimension to his performance and sound. Nate had a strong idea of what he wanted in terms of scale length and neck dimensions based on what he was already used to, so we worked closely together to translate that to a custom acoustic instrument that was right for him. The X20 has proven to be an excellent platform for extended range instruments, therefore it was the perfect choice for Nate’s build. We exchanged many Skype calls and emails to nail down all the details and specs and pulled out all the stops to finish it and get it to Nate in time for his unveiling on the Hilton stage at the NAMM Show in Anaheim, California in January, 2016. It was a pleasure to collaborate with Nate and turn our ideas into reality. And it was a thrill to get to watch his first performance with it at NAMM. This X20 8-string ended up being an instrument perfectly matched to the player. Nate recently recorded an album, “Innate,” which exclusively features his X20 8-string Emerald guitar. Listen and purchase this album here. “Innate” is also available on Spotify and Apple Music. Do you recall the first time you saw or heard an Emerald Guitar? If so, what were your first impressions of it (tonally, aesthetically)? So I went to my local guitar shop, Bananas at Large in San Rafael, to A/B it with other carbon fiber guitars that they had on hand. I took my wife, Honey, along as well for another set of ears. We A/B’ed a 6-string Emerald with all the other carbon fiber acoustics in stock, including many with much higher price tags. We were both very impressed with the tone and loudness of the Emerald guitar; the detail and craftsmanship were amazing, and the tone was exquisite. We have both attended the NAMM show many times and have seen and played the best of the best — $100,000 McPhersons, Lowdens, and countless others — so we had a good idea of what was possible. What led you to work with Alistair on a custom instrument? Alistair’s willingness to not only think outside the box, but his ability to do so meant that it could be possible for a high-end guitar builder to produce an instrument in my non-standard configuration. I can get 8-string hybrids, and I can get guitars that sound good, but discovering Emerald was my first opportunity to get everything at once. I was already set on carbon fiber, or some non-wood option, as I am not a fan of the problems that come with wooden guitars. Humidity and temperature changes can wreak havoc with stability and tuning. Also, knowing that I would have both bass and guitar strings on the instrument, it would have to be able to bear a ton of tension on the neck, bridge, and top. Winding up with a custom instrument that would be vulnerable to becoming convexed and bowed would be tragic.The structural strength of the guitar was extremely important. After trying out an Emerald, talking to Alistair and agreeing about price, I sent him the deposit and he got right to work on the guitar. I was on a deadline since I got booked for a spot on a NAMM stage as an acoustic 8-string player. I had been performing as an 8-string hybrid electric player for many years, but wanted to explore the opportunities available on an acoustic instrument, yet I didn’t own an 8-string acoustic! Not entirely sure why I got booked as that, but it never could have happened had I not found a luthier so optimistic and driven to excel under pressure. Alistair seems to love a challenge. He delivered it to me in time and the success of that show directed the course of my career for several years. Can you tell us a little more about the specifics of the instrument itself? I play a heavily modified x20. 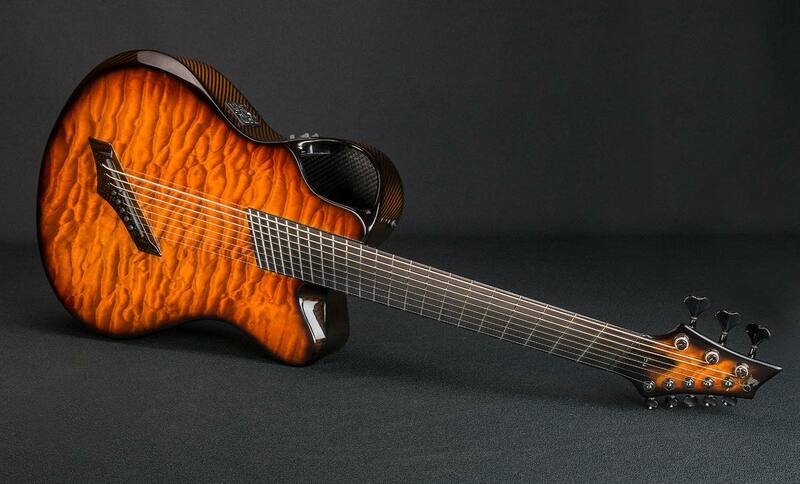 It has a quilted maple veneer that I chose, with matching gold colored fiber interwoven in the carbon to match. It is totally unique as it was the first hybrid guitar he built, though he has now delivered hybrids to other players. My instruments are always half bass, half guitar with separate pickups and outputs. They also have to be fanned fret, or multiscale. A bass is bigger than a guitar, so if you want bass strings on your guitar, you have to have a longer scale. The fan in the frets allows for a good guitar scale as well as a comfortable bass scale. The 3 bass strings are tuned EAD and the guitar strings are tuned ADGBE. Alistair used separate saddles and preamps to make this happen for my acoustic. It feels great to play. Lots of fun. It can take what I give it and it delivers both the tone and the volume that I need.